Tree Removal Denver is the #1 Tree Service Company in the Denver Area. We offer a full range of tree services, including tree removal as well as Stump Grinding. After tree cutting a tree, the work is not usually done; there will be a need to remove a stump. This is actually the hardest task. Many tree service companies seldom include stump removal leaving this unenviable task in the hand of a homeowner. That’s why it’s important to be a little keen when selecting a tree care professional and going with Tree Removal Denver. 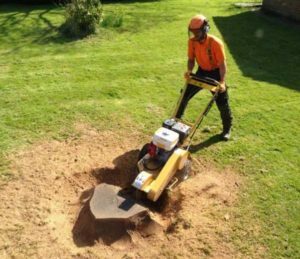 There are different ways to remove a stump, but grinding is the most preferred way. Stump grinding is quicker and efficient when on the hands of a tree care professional leave alone being less costly compared to DIY, which many homeowners usually go for, but of course this will depend on the type of a tree stump, its root systems, your soil conditions, age of the stump among other things. Our experts can help sort this all out, just give us a quick call and we’ll provide a free estimate!